Manager Russell Slade wants his Cardiff City players to react positively to setbacks after suffering his first defeat in charge. Danny Shittu's second half header saw Millwall win 1-0 and secure victory for the first time in nine games in the Championship. It was a first defeat for Slade, who won his first two games after succeeding Ole Gunnar Solskjaer. "That's what every manager wants - a reaction to every situation," he said. "It took a little bit of time to get a reaction when we went a goal down but in the future let's hope it's an immediate reaction. "I just think for the 15 minutes when they had scored, that gave them the lift and we started doing things that we hadn't worked on and our decision making wasn't good. "Even when you go down and it's tough, you've got to be mentally tough to deal with those situations." Cardiff should have taken the lead late in the first half when Adam Le Fondre fired too high after being sent clear, then shot straight at David Forde from six yards. That save proved all the more vital nine minutes after the break when Shittu, making his first league start of the season, made the breakthrough. "I still feel as if we should have got something out of the game," Slade said. "It was an open game and we had a couple of wonderful chances. But it proved elusive. "We need a reaction next week. It's another good game for us and we're at home and let's get back to winning ways." Slade's side host Leeds United next Saturday and the manager is hopeful top-scorer Kenwyne Jones will be available. The 30-year-old, who has scored five league goals in 12 games this season, missed the defeat at Millwall and the midweek home win over Ipswich. "I'll be disappointed if Kenwyne isn't back next week," Slade added. "He's got a foot injury and I thought be might be 50-50 today but it wasn't too to be." 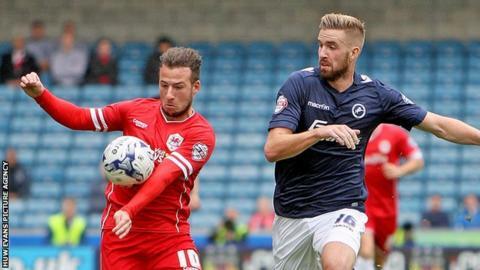 Midfielder Aron Gunnarsson was forced off at Millwall after being accidentally caught in the face by striker Ricardo Fuller in the first half. Gunnarsson suffered a nose bleed and had problems with his vision with Slade adding: "He's not too good at the minute but I'm sure he'll recover."